Don’t forget to pick up your Aerie A-List gift any Thursday in November. 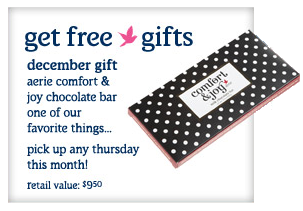 This month you’ll receive a FREE Aerie Comfort and Joy Chocolate Bar (retail value: $9.50)! Find your closest Aerie location using the store locator.